As a one-time “old car widow”, I have experienced an epiphany! 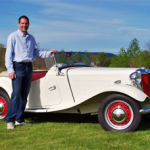 When my husband first joined the Vermont Automobile Enthusiasts, one of my friends suggested with great sympathy, that going to meetings and events would be just old car “stuff” and boring talk about old car “stuff”. I tended to agree with her, so Wendell and I reached an accord in that he wouldn’t require my presence at VAE activities if he didn’t have to go to craft fairs. At some point I decided I should be a little supportive since he was so enthusiastic and worked so hard to fix up our 28 Dodge coupe. I remember a phone call from him during the Shelburne car show asking if I’d be o.k. with him buying another car, a Plymouth roadster ( we really did “need” a car with a rumble seat). I, of course, was at a craft fair. Despite my surprise at the “consult” and having no clue what a “roadster” meant, of course I agreed and he was a happy man, a very good thing. When I started to attend meetings with him, I found myself meeting a lovely group of men and women whom I otherwise wouldn’t have met. They welcomed me and made me feel needed. Since I pretty much live to be useful and to feed people (ask any of our family), the potluck meetings fulfilled that desire. When Wendell became activities chair, requiring us to bring the basics for dinners, the “new fangled” coffee pot was a challenge, but again, there was always help. And, by golly, the meetings and events were fun, informative and interesting – and that Stowe show flea market turned out to be a bonanza of really good “stuff” I could relate to while the guys talked cars. To complete my “epiphany”, when we recently attended the Farm Show in Barre, just like my experience at VAE meetings, I noticed how pleasant and friendly people there were – they would smile back at you, something sadly lacking in most crowds these days. It is very good to be surrounded by “real” people. So, I guess this makes me an “auto enthusiast” for life, as VAE members are, like, totally real. Ladies, give it a try! DOT 4 fluid, which has a higher minimum boiling temperature requirement (446 degrees F dry and 311 degrees wet) soaks up moisture at a slower rate but suffers an even sharper drop in boiling temperature as moisture accumulates. Three percent water will lower the boiling point as much as 50%! Considering the fact that today’s front-wheel drive brake systems with semi-metallic linings run significantly hotter than their rear-wheel drive counterparts, high brake temperatures require fluid that can take the heat. But as we said earlier, the brake fluid in many of today’s vehicles cannot because it is old and full of moisture. Water contamination increases the danger of brake failure because vapor pockets can form if the fluid gets too hot. Vapor displaces fluid and is compressible, so when the brakes are applied the pedal may go all the way to the floor without applying the brakes! In addition to the safety issue, water-laden brake fluid promotes corrosion and pitting in caliper pistons and bores, wheel cylinders, master cylinders, steel brake lines and ABS modulators. FLUID RELATED BRAKE FAILURES From time to time we hear about reports of “unexplained” brake failures that caused accidents. When the vehicle’s brakes are inspected, no apparent mechanical fault can be found. The fluid level is normal, the linings are within specifications, the hydraulics appear to be working normally and the pedal feels firm. Yet the brakes failed. Why? Because something made the brakes hot, which in turn overheated the fluid causing it to boil. The underlying cause often turns out to be a dragging rear parking brake that does not release. But that’s another story. The same kind of sudden brake failure due to fluid boil may occur in any driving situation that puts undue stress on the brakes: a sudden panic stop followed by another, mountain driving, towing a trailer, hard driving, etc. A case in point: A child was killed in an accident when the five-year old minivan with 79,000 miles on it his parents were driving suffered loss of pedal and crashed while the family was driving in the mountains of Washington state. Fluid boil was blamed as the cause of the accident. Source for fluid change recommendations: Vehicle Manufacturer service information & owners manuals If motorists would only follow this simple advice to change their brake fluid periodically, they could greatly reduce the risks associated with moisture-contaminated brake fluid. You can extend the life of your brake system and likely save yourself a lot of money in the long run on brake repairs, especially if your vehicle is equipped with ABS (because ABS modulators are very expensive to replace!). Since you can’t tell how badly contaminated brake fluid is by its appearance alone (unless the fluid is full of rust or is muddy brown), the fluid should be tested unless you are changing it for preventive maintenance or as part of a brake job. There are three ways to check the condition of the brake fluid: Chemical test strips. A chemical test strip made by Phoenix Systems (888-749-7977) www.stripdip.com called “Strip Dip” can reveal the condition of the corrosion inhibitors in the brake fluid. The FASCAR chemicals react to the presence of copper in the fluid. The test strip changes color to reveal the condition of the fluid. When copper levels reach 100, it indicates the corrosion inhibitors are nearing the end of their life. If the copper level is 200 or higher, the corrosion inhibitors are worn out and the fluid needs to be changed. Electronic brake fluid testers actually measure the fluid’s boiling point. The test takes only about a minute and is quite accurate. If the fluid’s boiling temperature is getting dangerously low, replacement is recommended to minimize the risks of pedal fade caused by fluid boil. Sources for electronic brake fluid testers include Alba Diagnostics, MISCO and OTC. When the fluid is changed, use the type of brake fluid (DOT 3 or 4) specified by the vehicle manufacturer. The cap on the fluid reservoir will usually indicate what type of brake fluid is required. You can also find this information in your Owners Manual (look under brake fluid). As any brake fluid supplier will tell you, brake fluid is NOT a generic product. Just because a fluid meets the minimum DOT 3 or DOT 4 specifications does not mean it can tolerate moisture or provide the same degree of corrosion protection as another brand of fluid. Raybestos, for example, sells a “Super Stop Super High Performance” DOT 3 fluid with a dry boiling point of 550 degree F, which meets Ford’s latest requirements. There are also high temperature glycol based DOT 5.1 brake fluids (not to be confused with DOT 5 which is silicone based). The dry boiling temperature rating for DOT 5.1 is 518º F or higher, and the wet boiling temperature rating is 375º F or higher. Some racing brake fluids exceed the dry boiling temperature rating, but may only meet the wet boiling temperature requirements for DOT 3 fluid (284 degrees). So the next time you are inspecting or servicing your brakes, be sure to check the condition of the fluid as well as the level. If you add or change fluid, use type specified by the vehicle manufacturer (DOT 3 or 4) and use the highest quality fluid you can get. And above all, remember the benefits of changing the brake fluid for preventive maintenance.